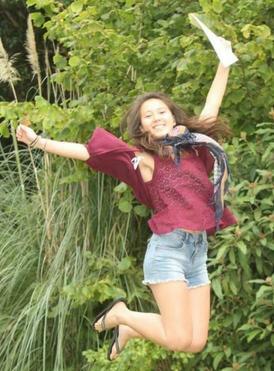 This young woman received her A-level results this week. She passed eight at A* and a further three at grade A. All in one go. Eleven all in one go - that's more exams than all but the brightest pupils take at GCSE. If a boy - ideally a reasonable-looking lad who went to a state sixth-form college - had achieved such results, he would probably have made at least a couple of front pages. But Libera Zi-Zai Assini is a girl who went to a grammar school. 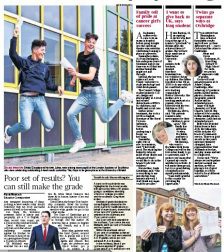 And pictures of pretty girls leaping in the air on A-level results day are an unforgivable cliché that no self-respecting national newspaper . dare allow on the front page. Editors who on 99 days out of 100 demand attractive women for the cover suddenly banish them and cry instead: "Bring me boys!" That was a piece of cake yesterday as the police investigation of Cliff Richard dominated the popular news agenda. With a story like that, it's astonishing that anyone chose to run an A-level picture on the front, but the Guardian and Times both did. The Guardian showed a bit of wit and used teachers in Bristol doing the jumping for joy lark; the Times had four boys performing the A-level leap, but we weren't given their names or told how they had got on. They came from Ashford in Surrey and had been invited to open their results at Thorpe Park - a cute PR stunt that paid off with a picture in the Star as well as the Thunderer. That Times front page photograph was outright tokenism. Those boys were there for no reason other than that they were boys, and there was no attempt to relate them to the story. 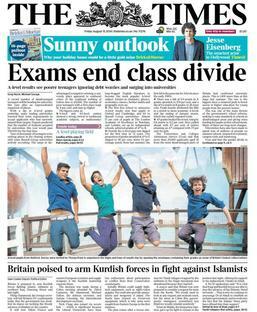 That, incidentally, was a particularly clear piece of reporting from Greg Hurst, although the "Exams end class divide" headline was perhaps over-optimistic. So what of the rest? The girls may have been shooed off the front pages, but they were still out in force inside. Miss Assini turned up three times, but was generally outshone by Tabitha Jackson, who dropped only 14 marks out of 1,600 in securing four A*s. Miss Jackson has long blonde hair, one of the required elements of the A-level cliché. That undoubtedly influenced picture editors choosing who to feature - but at least she was on the light table on merit. Even after all the mockery and "reform", the vast majority of the teenagers illustrating the A-level pages were there for no reason other than that they looked good. 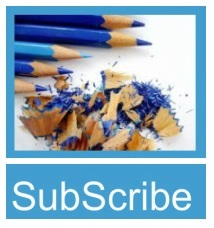 So here's the SubScribe A-level picture audit. 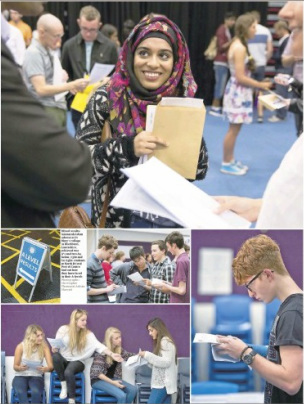 The main photograph of the picture module at the centre of the Guardian's 6-7 spread is of Ammarah Adam, of Blackburn, who achieved 2 A*s and 2 As. She is not mentioned in any story. The three other pictures (excluding the road sign) are of students of North Bristol Post-16 Centre, none of whom is named. A story about the centre explains that it is run by two schools (Cotham and Redland Green) and mentions two or three individual results, but there is nothing to tie the pictures and story together. Funnily enough, the front-page picture is also from Bristol: Redland High, an independent girls' school. 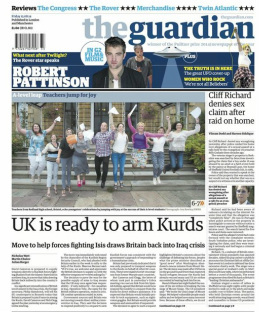 Not quite what you expect from the Guardian. The top double on page 7 comprises a series of bullets telling individual stories. This is illustrated with a drop-in picture of Hana Barzijini, whose family fled Iraq 12 years ago. She did her A levels at Rochdale sixth-form college and is off to Manchester to study medicine with 3 A*s in her pocket. There is also a cut-out of triplets Alex, George and Zoe Ellaby who went to an independent school in Harrogate, and secured five As and 4 Bs between them. Tabitha Jackson holds up the first of two spreads in The Times. She is joined by Pa Njie, 24, who lost his legs in Afghanistan and is now going to study business at Aston University, having achieved three As. Clare Rees-Zimmerman, from Sheffield High, bottom left, secured five A*s at to go with the three she achieved at 16. She also got an A for French. Aisha Abdulsalam, bottom right, passed two A levels and wants to become the first Kurdish woman commercial pilot. The second spread has more leaping boys: Gvidas and Lukas Girzadas, who studied at the London Academy of Excellence, a free school in Newham. 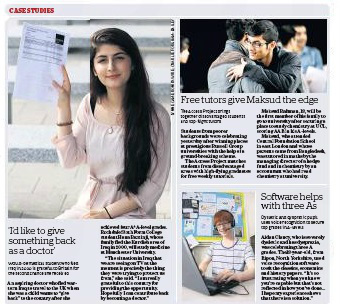 The picture goes with the spread's lead story, which is about pupils from the academy achieving Russell Group places. 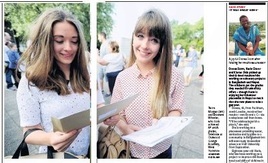 We don't know the twins' results, but they did well enough to get into Bristol. Drop-in pictures in the right-hand panel are of the Iraqi Hana Barziniji, and Samantha Adams, who has leukaemia. Another set of twins, Jenny and Carrie Soderman hold up the page. They did the AQA baccalaureate at the King Edward VI school in Birmingham , each achieving distinction. Carrie is going to Cambridge and Jenny to Oxford. 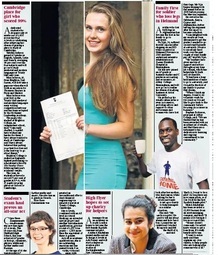 Tabitha Jackson appears again in the Telegraph's spread, in the company of other students (male and female) from Brighton College, including the actress Izzy Miekle-Small, who achieved 3 A*s. Both also have little drop-in shots in the panels underneath. The right-hand picture is of boys from Wilsons grammar school in Wallington, Surrey. We are given their names, but not their results and there is no mention of them or the school in any of the stories. The soldier Pa Njie and Libera Zi-Zai Assini, the Colchester Royal Grammar School superstar, feature in the other two panels. Another set of twins take centre stage in the Independent's first spread. Morgan and Bronwen Wheeler, who attended the Outward Grange Academy in Wakefield, each collected two As and an A*. The academy is the subject of a case study and the twins' performance is an element of the story. The sidebar photograph is of Donna Scott, who is volunteering in Bangladesh and was told by phone that she had achieved two Bs and a C. The second spread is illustrated by a photograph of four young men who studied at the Central Foundation School in East London. The school is featured in the story alongside, which is about an access scheme which pairs students with high-flying graduates who offer free tuition. It mentions one of the four, Maksud Rahman, who will be the first member of his family to go to university, having secured a place to study chemistry at UCL by achieving two As and a B.
Beth Gill, an international hockey player off to Loughborough, makes the first of the I's three pages. The following spread features Hana Barzinji, Maksud Rahman, and Aidan Clancy, who got three As with the aid of software to help him to cope with dyslexia and dyspraxia. 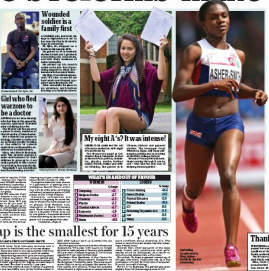 Dina Asher-Smith is the main photograph on the Mail's spread. She received a text from her mother to say that she had got into Kings College London just before she competed in the 200m heats in the European athletics championship. She didn't know details of her results, but said she needed three As. The other pictures are of the soldier Pa Njie, Miss Assini from Colchester, and the would-be doctor Hana Barziniji. Readers can always trust the Express to stick to the tried and tested formula and yesterday was no exception. The entire page 3 coverage was overlaid on a picture of Tabitha Jackson with the Soderman twins from Birmingham offering support. The Express even ran the traditional leap photograph of three students (two of them blonde) from Cheltenham. The paper did not apparently feel the need to tell us who they were, which school they attended or how they got on. The main story did, however, have a jolly nugget about Nottingham Trent university emailing students who failed to get the required grades offers on alternate courses - before the results were released. Ooops. More token blondes from the Express's sister, in this case Hope Martin and Isabelle Vitty who achieved "top marks" at the Merchant Taylors' school in Crosby. We are told no more. They are joined by Miss Jackson - with the caption "brain babe", Izzy Miekle-Small and Libera Zi -Zai Assini. The boys are represented in another photograph from the Thorpe Park PR exercise and Thomas Lowson, who is there not because of his academic prowess but because of his super-slimming abilities. He was bullied at school over his weight and has lost ten stone. I'm not sure his future fellow students at Leeds Trinity University needed to know that. Nine smiley girls hold the centre of the Mirror's 28-29 spread, which comes way behind Sir Cliff, Downton Abbey's anachronistic water bottle, a house gambling offer and the 3am gossip pages. The girls come from Newcastle High, which is mentioned in passing in the wrap story without giving any useful information: "Among teenagers overjoyed by their results yesterday were girls from Newcastle High School." The drop-in pictures are of Dina Asher-Smith and Pa Njie (hidden by the tablet video symbol). Before and after pictures of Thomas Lowson accompany the basement. A tongue-in-cheek approach from the Sun, which pushed its coverage even further back than the Mirror, to pages 30 and 31. The main picture again comes from Brighton, but unlike the Telegraph's version it is almost entirely populated by girls. There's a little bubble saying "here I am" from the one boy who can just about be seen in shot. The anonymous girls from Cheltenham who appeared in the Star resurface here, and we are at least told this time that they come from Pate's Grammar, and there are more leaping girls from Manchester High, none of whom are named or mentioned in the copy. The slimline Thomas Lowson reappears with his former self and Tabitha Jackson completes the coverage. Altogether there are 80 pictures of girls - exactly twice as many as there are of boys. Tabitha Jackson apears seven times, Thomas Lowson five, Hana Barziniji four. Libera Zi-Zai Assini, Pa Njie and Izzy Meikle-Small appear three times each. Of the 120 faces that appeared across the papers, 102 were white. Thirty-seven had long blonde hair. The annual moan-in started first thing on Thursday, first people predicting a parade of pretty girls in strappy tops and then those who said "why the fuss, people do exams every year?" To deal with the second point first, half a million teenagers will be heading to university at the end of next month. If you take into account their families and teachers, there are milliions with a direct interest; millions who surf the internet, watch television, listen to radio and even buy newspapers. Add to them the whole education establishment and businesses who will eventually employ these kids, it matters. So back to the strappy tops. Not so many on display this week - too chilly - but there were a few midriffs as well as an upsurge in the number of hoodies and polo shirts. Girls continue to outperform boys, and it is right that the spotlight should shine on the highest achievers: they are the people who will run the country or find new cures for disease or start up businesses. They are, however, overwhelmingly from independent or selective schools. This year there has been a slightly greater emphasis on the "disadvantaged", but the definition may not be one you'd recognise. It doesn't mean struggling to keep going with parents who are out of work with no prospect of finding any. It means anyone without enough money to go to a private school or enough luck to live near a grammar school. Several papers focused on the Gove reforms, free schools, city academies, and in many cases the text was informative. But the pictures - and this is a picture audit - rarely married up with the words, so that there were too many token pupils of both sexes. The photograph of Ammarah Adam in the Guardian is charming, but why is it there? Her results were not particularly exceptional in the national context. Perhaps if we knew more about her or her school, we would see a reason for her presence, other than that she is pretty and isn't white. Tokenism doesn't relate only to gender. The case studies we see are almost invariably provided by schools that want to blow their trumpets. Savvy head teachers send out press releases to national education correspondents the day before the students get their results and offer guidance on the top performers. Meanwhile local papers and agencies will be contacting every school in their areas and try to sell the best stories and pictures to the nationals. If schools aren't media smart and local outfits no longer have the manpower to do their own research, the supply of good human interest stories will be slim - as it seems to be this year. This is the most popular angle and Hana Barziniji, the girl from Iraq who wants to "give something back to Britain" by becoming a doctor, features widely. She has lived here since she was six, she has grown up here; by making her seem special, we are almost saying "fancy an Iraqi being bright enough to read medicine at Manchester". A Kurdish girl passes two A levels and wants to be a pilot, a boy who has lost a lot of weight gets two Cs and a D. He isn't on these pages to celebrate his exam performance, and he shouldn't be on these pages, for his presence says "fatties can't pass exams, but get thin and maybe you will". You could, perhaps, say the same about Pa Njie. Losing your legs should not affect your brainpower, but his is nevertheless an uplifting tale of someone who has suffered from the horrors of war and emerged to start a new career in business. The i came out best on these sorts of stories - with the mentoring scheme that allowed Mahsud Rahman to flourish and the software that gave dyslexic Aidan Clancy a chance. These are developments that can benefit others seen to be working. This year there are only two, the actress Izzy Meikle-Small and the athlete Dina Asher-Smith. Hers was the closest to a real story - receiving a text just before competing in Zurich. On the other hand, is Beth Gill worth a place in the i? Hockey player goes to Loughborough. So? We have three sets of twins and one of triplets this year. The Sodermans are interesting because they took the baccalaureate rather than A levels - although no paper explained what this was - and because they are heading to Oxford and Cambridge. The Girzadas boys in the Times might be interesting if we knew their results. The Wheelers are relevant because of the school system of which they were a part. And the triplets? Well triplets are always interesting, aren't they? Almost all of the photographs were taken at independent or grammar schools. Even the Mirror (Newcastle High) and the Guardian (Redland High) feature pictures from private schools. Sheffield High (Times) and Ashville College, Harrogate (Guardian) are all fee-paying.